February 25, 2014 /0 Comments/in Toenail Fungus /by Jenn F.
Anyone who has had insidious toenail fungus knows it’s difficult to get rid of once you have it. In fact, it’s so hard to get rid of that some people go to the extreme and have a nail removed! More research is needed to determine whether light-based treatments will be the next generation of toenail fungus treatments, but a review published in the December 24th edition of Lasers in Surgery and Medicine indicates that there is hope for onychomycosis sufferers. Laser toenail treatment may be the next frontier in treating onychomycosis, but better studies must be developed. What Can Lasers Do to Treat Toenail Fungus? Dr. Mark E. Spier, DPM of Baltimore, Maryland explains that toenail fungus is notoriously difficult to treat. “Toenail fungus, a condition that affects more than 35 million Americans, is both easily spread and exceptionally durable, often standing up against the most aggressive antifungal pills,” he told Disabled World magazine. In many ways, laser toenail fungus therapy sounds like a no-brainer — a good first line treatment for onychomycosis. After all, basic research made a strong enough case for the lasers to receive FDA approval for the treatment of toenail fungus. However, it’s newness works against it, as there have not been enough studies to sway insurance companies. Toenail fungus can be treated using laser lights, but insurance providers do not yet cover the cost. In the latest review of existing research, Arisa E. Ortiz, MD and colleagues found that “many of these studies are small or poorly designed.” That could be why patients are encountering resistance from insurers who refuse to cover the $800-$1,000 cost of laser toenail fungus removal. She explained that energy-based treatments can succeed where other treatments fail. For instance, topical treatments cannot penetrate the nail plate. Oral treatments carry the risk of liver toxicity. Yet, there are many variables that need to be studied. “Further evaluation and larger studies are needed to determine the optimal light source, pulse duration, and treatment schedule for long-term success,” Dr. Ortiz concluded. 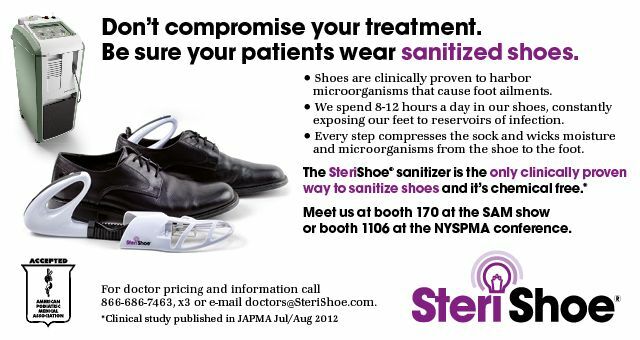 Podiatrists recommend UV shoe sanitization to prevent re-contamination. Our revolutionary product also uses light to get rid of onychomycosis. It’s not safe to put UV light on the skin or nail, of course, so the SteriShoe device works on the biggest source of re-contamination: the shoes. To get rid of toenail fungus, you will first need to pursue laser toenail fungus treatment with the Nuvolase PinPointe Foot Laser or Cutera GenesisPlus. Before putting your shoes back on, you should treat them with the SteriShoe UV shoe sanitizer to kill residual spores that serve as a major cause of re-contamination. Since you will be paying out of pocket for effective onychomycosis treatment, you may as well spend a few extra dollars to ensure that you’re not susceptible to infectious fungal spores breeding in your footwear. The product may be purchased here for home or podiatry office use.